Shake and make your very own Plaster of Paris models with a fabulous Shaker Maker set. Whether you chose the generic dinosaurs or pets or decide on sculpting your favourite characters, Shaker Maker is a fun and easy way to create two detailed plaster models. 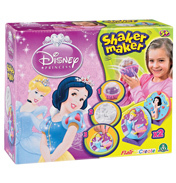 Shaker Maker was first invented and sold in the 1970s and has become a popular activity toy once again. Plaster starts off as a dry powder but makes a paste when mixed with water which then hardens. Everything you need for your models is included in the pack and so you are ready to create! Once the powder has been mixed with water you will need to shake, shake, shake before it starts to set. Follow the detailed instructions to ensure you finish up with a beautiful bubble free sculpture. When your model is dry you can begin to paint it. Don’t worry if you don’t get it right first time, the moulds are reusable if you wash them after use and refill packs are available. So which is your favourite character? You can shake your way to Buzz Lightyear, Ben Tennyson, Tinkerbell or perhaps Ariel. Then paint and display your models for everyone to see. Just Shake it, Make it, Paint it!